SAY ANYTHING DO BETTER LYRICS"
Are you opposed to having fun? you clench the world between your buns. you could do better, you could do better, you could be the greatest man in the world. you could do better, you could do better, you could be the greatest man in the world. your life is always the post of something else.. where is the present in the way that you present yourself? and it's disgusting how little that you try, the existential equivalent of pink eye. to tap your tune with silver spoons, anthem of impending doom. guiding Satans steady hand, forcing beatles to disband. you could do better, better than that you're a fraud. thank god you learned to keep your shirt on. you could do better, you could do better, you could be the greatest man in the world. you burn so brightly, you burn so, you burn so. we could do better, we could do better, we could be the greatest band in the world. 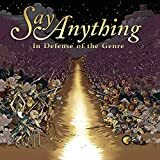 All Say Anything - Do Better lyrics are property and © copyright of their respective owners. All Do Better lyrics provided for educational purposes only.